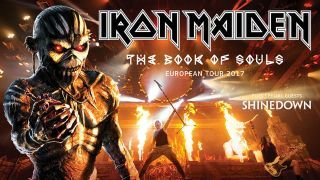 Additional London and Frankfurt shows added to Iron Maiden's 2017 Book Of Souls tour due to "phenomenal demand"
Iron Maiden have added extra London and Frankfurt dates to their 2017 European Book Of Souls tour. The metal giants announced 16 European dates last week and have today confirmed extra shows in London on May 28 and Frankfurt on April 29, to go along with the previously announced London gig on May 27 and Frankfurt on April 28. LiveNation’s President of UK Touring Andy Copping says: “The demand for Iron Maiden has been quite extraordinary. We knew the tour would be in high demand but to add a second show at the London O2 arena at such an early stage demonstrates just how strong Iron Maiden are in the UK. “We haven’t even gone on sale to the general public yet the tickets have been snapped up by the Iron Maiden Fan Club and Live Nation and O2 venue customer pre-sales. Ahead of the tour announcement last week, Maiden revealed they were stepping up action against ticket touts by implementing a paperless ticketing system for the UK dates. Tickets for both new dates go on general sale at 9am on September 30 (Friday) alongside all previously announced shows for which there are still tickets remaining. Shinedown will support Maiden on the tour. The full list of tour dates can be viewed below, with the new shows highlighted in bold. Iron Maiden released their 16th album The Book Of Souls in September last year. They launched a world tour earlier this year onboard a new-and-improved Ed Force One, piloted by frontman Bruce Dickinson. The tour opened in Florida in February and visited 36 countries.